Last night, my husband and I went into the city for a little date night and it was so much fun. The lights, the shoppers, the music; it is truly magical in Chicago during the holidays. We are so lucky that we live close enough to the largest city in the Midwest to be able to just pop in and out rather than making a trip out of it. So we have a history with our great city; both of Mike’s parents grew up on the north side of Chicago as did his grandparents. His great-grandparents emigrated to Chicago from Ireland many years ago and all of the men were Chicago cops until Mike’s dad broke tradition and became a cop in the burbs. Then Mike went and ruined the tradition altogether by going into Sales. There is even a pub in the Lincoln Park neighborhood with Mike’s granddad’s picture up on the wall. The River Shannon, if you happen to stumble upon it, is a tiny little place with lots of character that gives out free hot dogs on Cub game days (Go, Sox!). So there is that history and then there is our history with Chicago. I met my husband at the Taste Of Chicago in Grant Park in 1993 through my brother. We had our first date two months later at a White Sox game. And when we reconnected nine years later, he told me he loved me at the top of the John Hancock building. I am not sure how planned it was but again, really romantic. I love this city so much but not at first. When I moved here in 1989 from Ohio, I truly hated it here. It was so radically different than where I came from; the cars drove too fast, there were way too many lanes on the highway and the people were just not as openly friendly. But over the next twenty years, however, I grew to love it. I have made the best friendships I have ever had here, worked some great jobs with some wonderful people here and met the love of my life here. It’s good to be from two very different places and thank God for moving me here or I would never have met the three most important people in my life: Mike, Annie, & Ellie. One thing that inspired me to write this post was the fact that although Mike has lived here his entire life, he has never been to Marshall Field’s on State Street. I refuse to call it Macy’s. 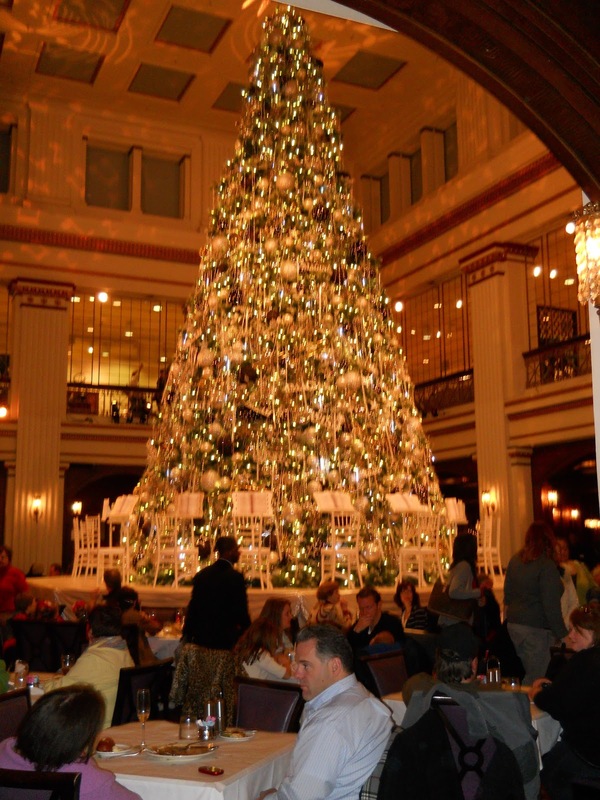 It is such a magical place with the window displays, the big tree, the Walnut Room. None of it had he been to, so I was excited to share it with him. This is the Big Tree in the Walnut Room. We got a beeper and were told it may be up to two hours to wait but the lady said it is usually never that long. But we were hungry and so we ended up eating at a Corner Bakery under the El on Wabash where two of the employees were fighting over the movie Coming To America. 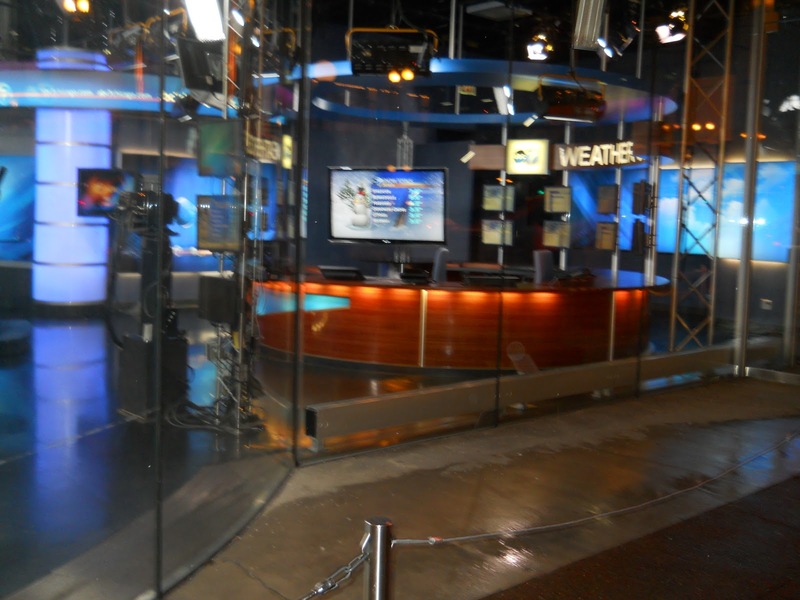 The channel 7 newsroom on State. 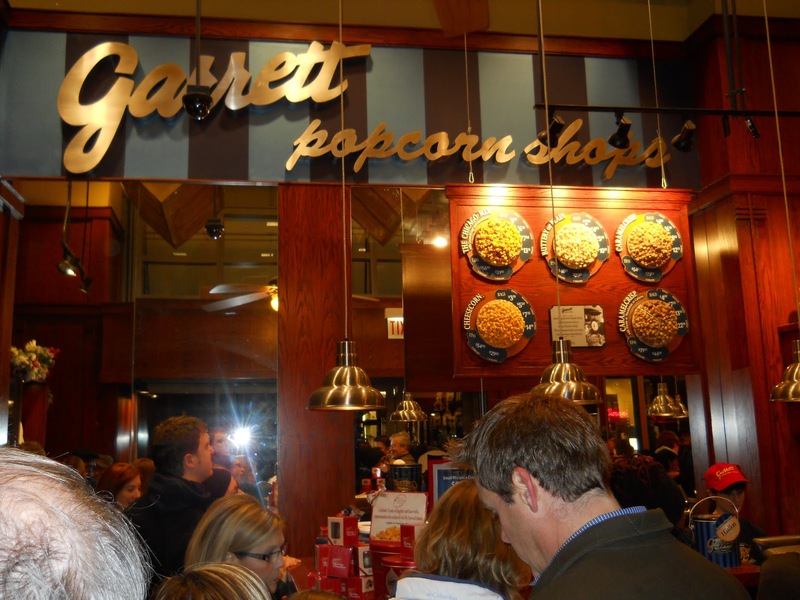 We decided to do the “touristy” thing and waited in line for fresh Garrett’s popcorn. This is also somewhere Mike has never been which completely shocked me. It leads me to believe that sometimes it is good to be a tourist in your own city. It was so much fun to do these things and it cost us a fraction of what it would to travel to another big city in the Midwest. Our trip to the city for an evening cost us less than $40.00! Now mind you, we didn’t do shopping but there are malls and boutiques near us and we were just looking for ambiance. All in all, it was a wonderfully romantic evening and so much fun to be in the city at Christmas. The guy driving up and down the Magnificent Mile in his ’78 Vega with a megaphone yelling “Happy Hanukkah!”. I SWEAR I am not making this up. The elevator full of people on the 7th floor of Marshall Field’s who couldn’t get off the 7th floor. I bet they are still there. The lights in the trees and the music coming out onto the streets from all the stores. Holding the hand of my soul mate while reminiscing about our Chicago past. Enjoy this first weekend in December, my friends. Chicago is the best city! Better than New York. I've never been to the Walnut Room. I wanna go there! Go CUBS!